“Secure it, pop it, screw it, cut it, work it.” You better believe James Bond is wearing these, whether or not they announce it in the movies – how could Q not include them in his awesome arsenal of secret gadgetry? 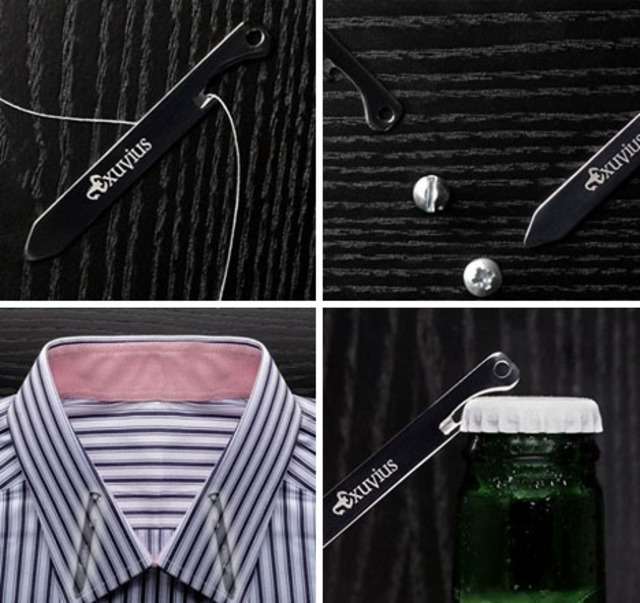 Fashionable functions include: a cutting tool for stray strings (or other things), a bottle opener for the party-goer and, of course, a screwdriver … because really, you never have one when you need it (especially on the go). 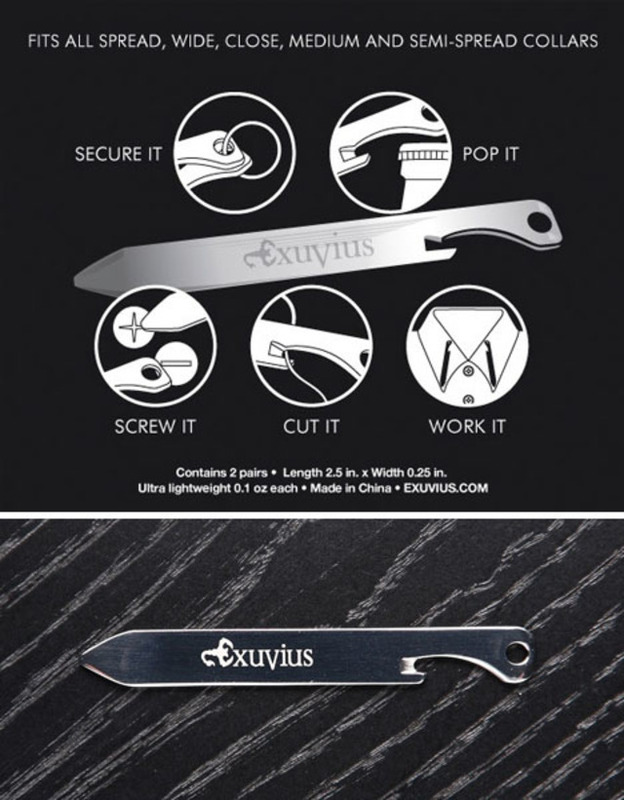 For the well-dressed do-it-yourself type, these genius little inventions from Exuvius offer a handy alternative to pocket tools, which are particularly cumbersome to carry in suit pockets or dress pants. 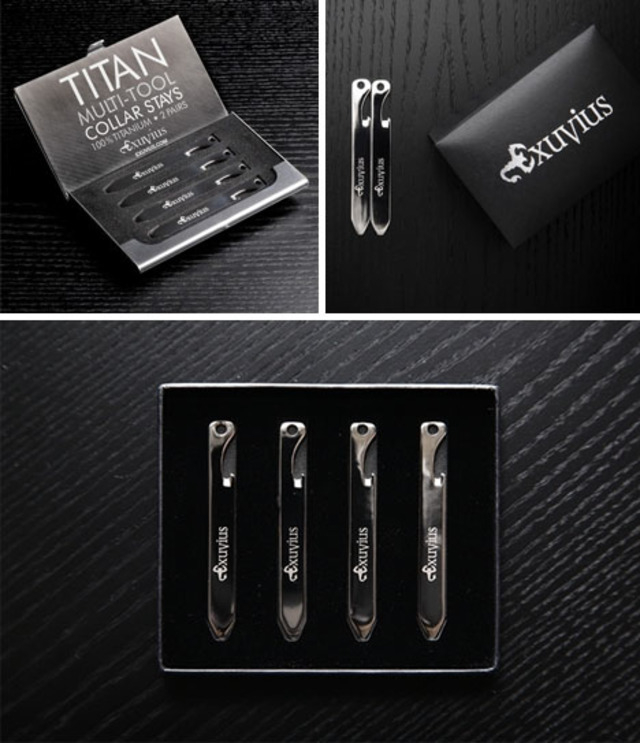 The multi-tool collar stay kit from Exuvius is distributed in SERE (Survival Evasion Resistance Escape) kits around the world, comes in a pair and its made of 100% titanium. It fits alls spread, wide spread, close spread and semi-spread collars and contains a half-Phillips head screwdriver, slotted screwdriver, thread cutter, bottle opener and keychain hole for transport or carrying spares. It includes laser-etched Imperial and Metric measurement markers and weighs just .4 ounces.